We arrived in the afternoon at Yellow Pinch carpark where the walk to Mt Barney's summit begins. The weather forecast was grim but also overdue. We waited to see how bad it would get before deciding if whether to walk off and camp in the forest at the base of this impressive looking peak. At 2pm the rain arrived. At 4pm we skedaddled, tail between our legs, as water barrelled down the road, side gullies gushing like fire hoses and the causeways along the road rapidly going under. 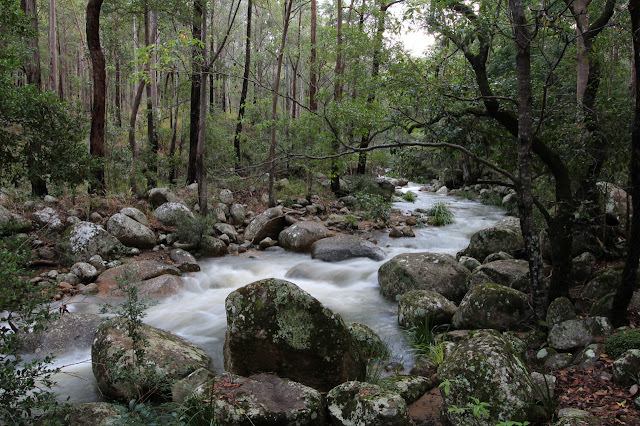 According to records, areas surrounding Mt Barney recorded between 50-70mm of rain that afternoon and evening. We ended up back at Rathdowney Pub, which had no rooms available and the kitchen was closed. We ordered a beer and watched the torrential rain. Swollen gutters on the road overflowed onto the footpath. It got dark. We lingered in the pub but finally moved to the Showground Caravan Park and pitched the tent in continuing rain, grabbed our sleeping bags and dived in. We shared a cold tin of salmon mixed with cous cous soaked in cold water. By morning the sun was out and we returned to Yellow Pinch to find the causeway on the access road under fast flowing water. And this is where we wait. An hour passes. The Logan River has been much, much higher in the night, as evidenced by debris lines on the road and riverbank. About 11:30am we tire of waiting because we are not really sure what we are waiting for. The causeway can obviously be waded across. 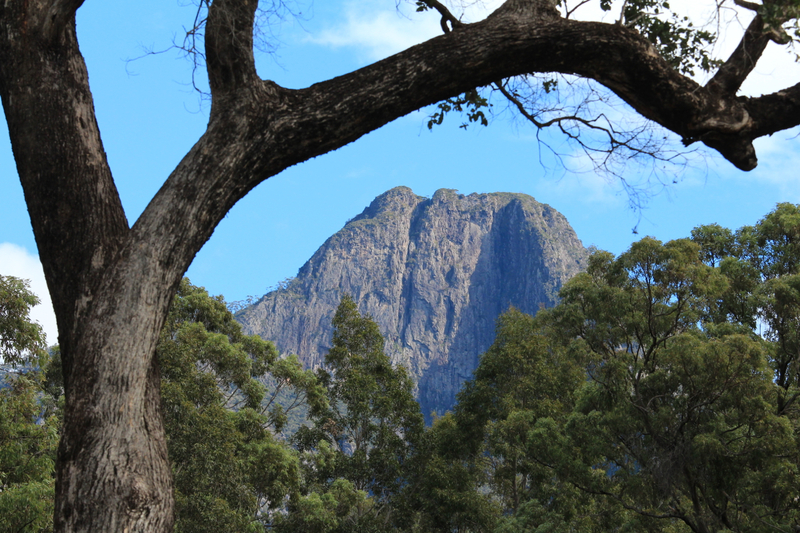 Mt Barney is visible through the trees. Everything is just wet, water gushing from every crack and crevice and dip and hollow in the surrounding landscape. We walk to Yellow Pinch Picnic Area and take the old road up and over Yellow Pinch saddle. 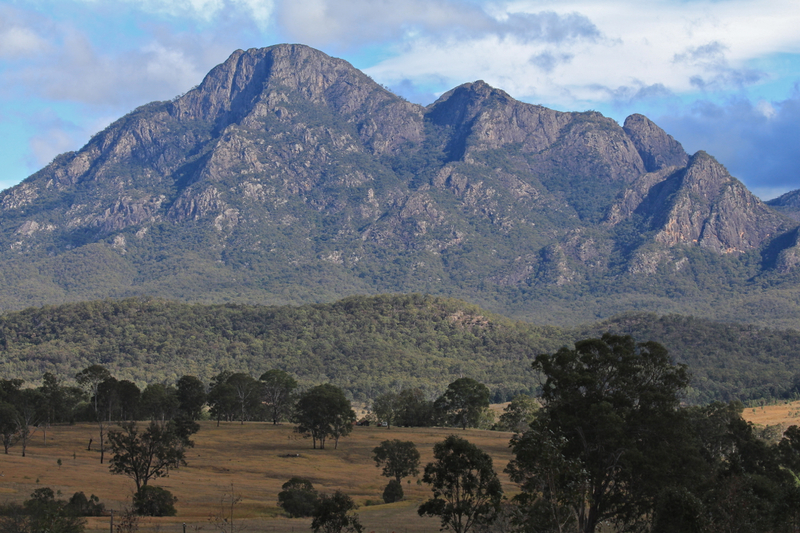 On the other side, that first view of Mt Barney is infectious. Summit fever sets in. 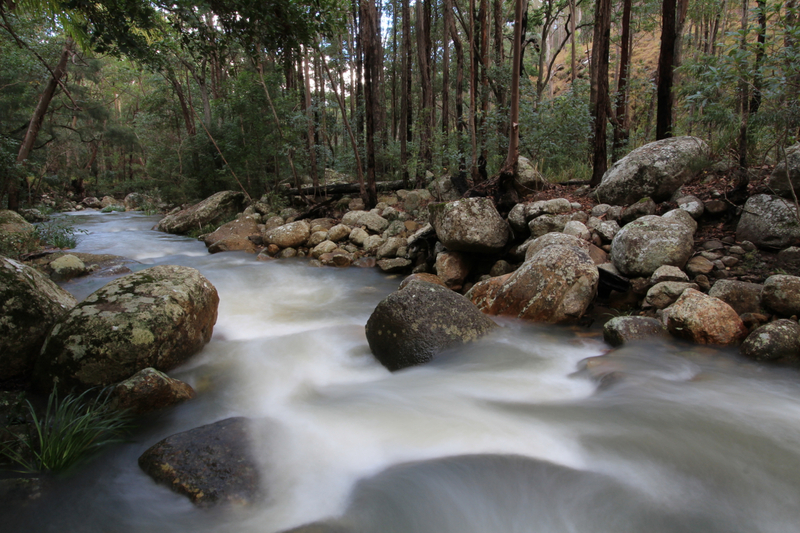 The next river crossing is faster and deeper but easily manageable. We are now following Cronan Creek and reach campsite 9 at 12:30pm. As we have not passed any other numbered campsites I question whether campsite 10 should be ahead or behind? Where is 8? For that matter 1, 2 or 3? Campsite 10, according to all track notes for this walk, is the closest to the start of the two main summit tracks. 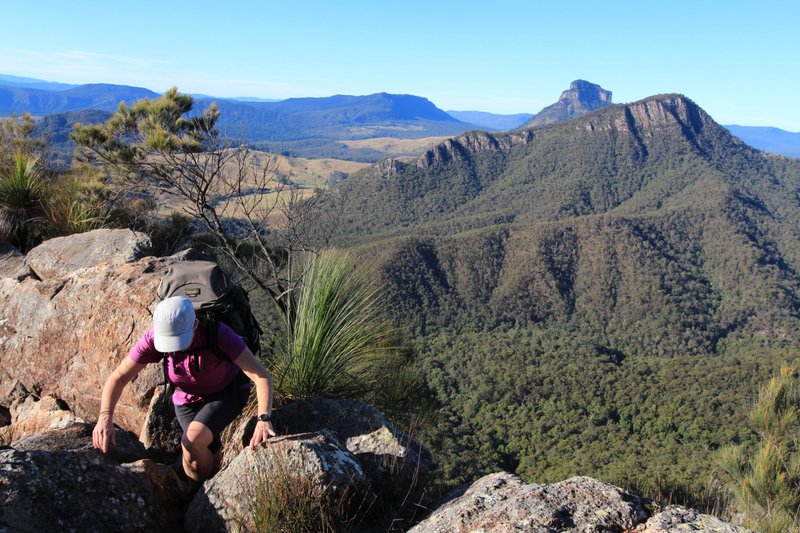 Our plan is to walk up the South-East Ridge track, spend a night high in Rum Jungle campground and then return down the South Ridge track. When we do reach campsite 10, a further 1km on from campsite 9, we eye off our watches. Tomorrow is the winter solstice. We are one day this side of the shortest day of the year. In the afternoon light, sections of the mountain catch the sun and glisten with last night’s rain. These are always difficult decisions – when to go, when to wait, choosing the weather, hoping for the most perfect experience of a long-anticipated destination. We go into a holding pattern again, wanting to give the mountain time to dry out a bit, and not wanting to rush up or run out of light. We console ourselves with the fact this is further than we got last time but can't help wonder if we will ever reach this summit? 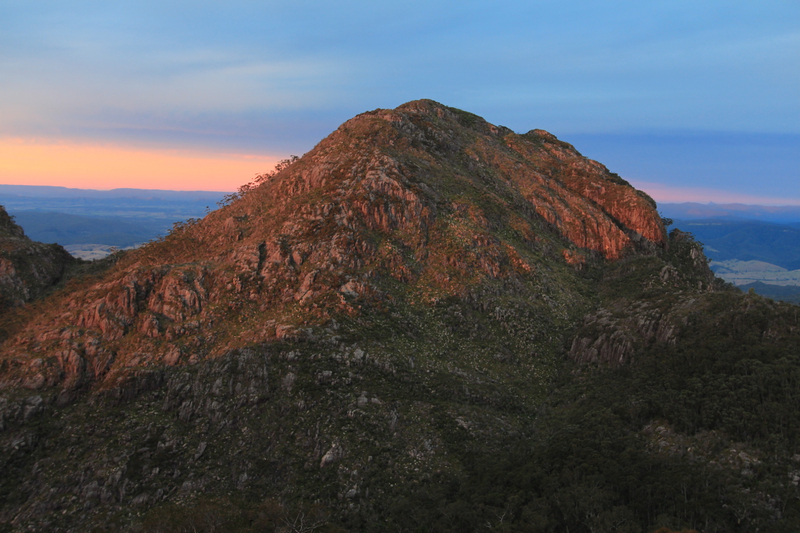 As the highest peak in southern Queensland, Mt Barney can be climbed by over 20 different routes. It is a bushwalking mecca with its narrow, precipitous ridges and twin summits, East and West Peak. All approaches are physically challenging as the height gain is 1000m, from Cronan Creek at the bottom, to the summit of East Peak which is the main destination for all walkers as it affords the clearest and most magnificent views. (see this discussion on Bushwalk Forum about the grading of the different routes). Many of the routes are also a challenge of courage and heights and exposure. The following morning we depart at 7am. We can see some stunning sunrise light up high. It is visible through the trees. Perhaps we should have begun in the dark, I rue. 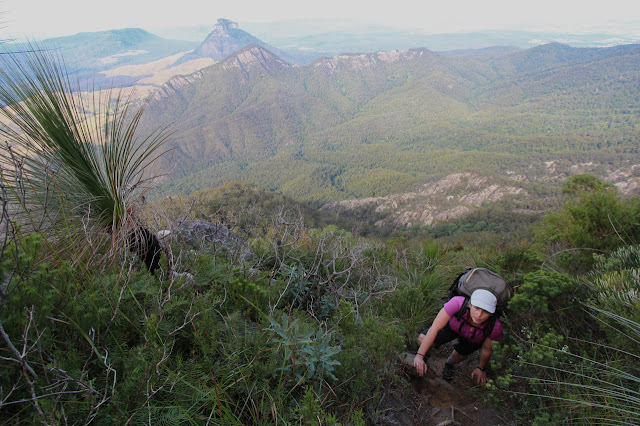 At first, the South East Ridge track climbs slowly and steadily up through forest – in a way this is more taxing than when we hit the rocky step-ups and scrambles. About halfway up the ridge there is a nice rocky spine to follow. The track is very clear. Ahead the summit is visible but always seems a long way off. Caz says every step is one step closer, and I repeat this to myself as I climb. At one point we take a detour left at what we assume is the long slab that all our information suggests is this routes most challenging obstacle. A small, one-move-wonder climb is required. The slab looks wet and slippery and reinforces our decision that leaving our ascent until today was a wiser move than if we had climbed immediately after the heavy rains. But after rejoining the main pad, the sight ahead jangles my nerves. The mountain rises like a wall. I am supposed to scale that. There is a lot of information online and in print about climbing Mt Barney and for another perspective on taking the South East Ridge route see HikinginSEQld. I agree with Cameron's description that: "Overall this was a harder but also more rewarding ascent route than the South Ridge. The views were breathtaking and the track was more consistently interesting." : "...in one brief section…you scramble upwards for perhaps four or five steps immediately above the east face. Although the section is so easy and quick that few people even notice the drop below, care is required. 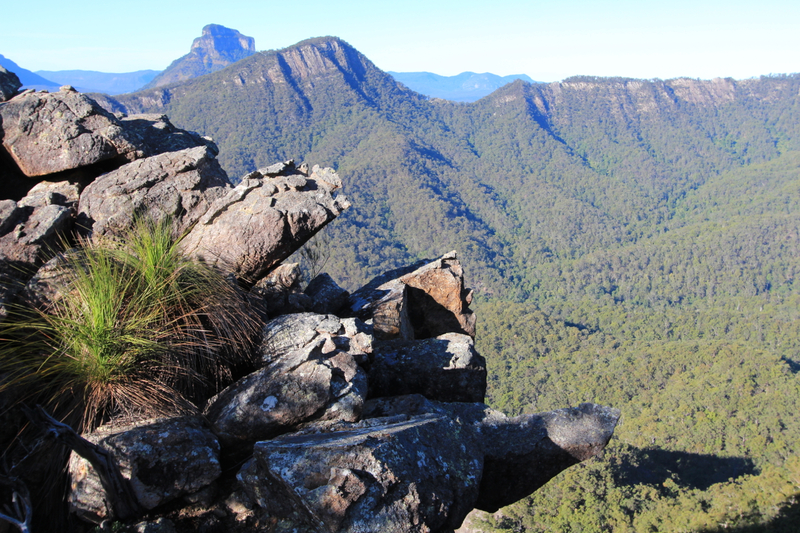 There is little scrub between you and the cliff edge at this point and any mistake could lead to a fall of some 300m." 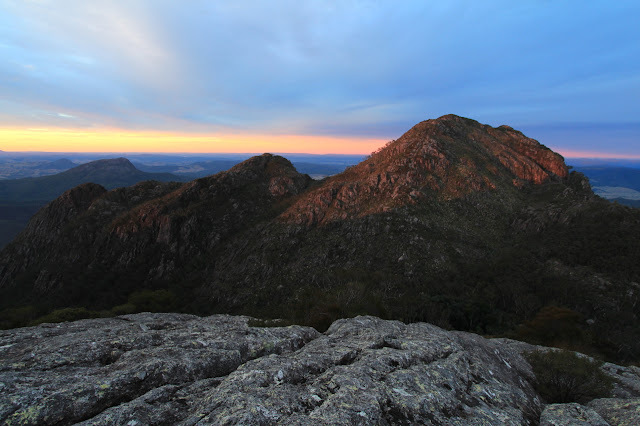 In fact, I notice several climbs that feel unnervingly airy and I thank Caz for allowing me to keep on moving and not hang around on a precipitous climb for what would have made an awesome Mt Barney climbing shot. The rocks we are climbing are also oozing with water. The weight of my overnight pack requires extra concentration and effort. One longer section of very wet rock causes a protracted pause. Caz suggests climbing right where it is drier but I feel that route is excessively exposed. I am more comfortable on the narrow, wet section as it initially has a few steps for me to use. So, I go first. There is one big stretching move at the top. A final hand hold is invisible until I blindly reach out and search with my fingers and find a bomber. I am up. These are not technical or insurmountable climbs and in dry conditions, with a day pack on, they really probably aren't worth mentioning. But, I mention them here. The reward of this challenge is truly amazing summit views. It is worth those few nervous moments. It is most certainly worth the wait. The view is vast. We can see Brisbane's high-rise buildings. Mt Warning peaks over the caldera and the Border Ranges, west is Bald Rock. That is a guide to the extremities. In close, there is much more. The Main Range stretches its long spine to the west. Moogerah Peaks dot the valleys below. Mt Maroon, such a unique peak itself, looks small and insubstantial from up here. Mt Lindesay is still undeniably grand. We have paced the bottom of this mountain, circled it, admired it from afar (see our Mt Maroon blogpost). 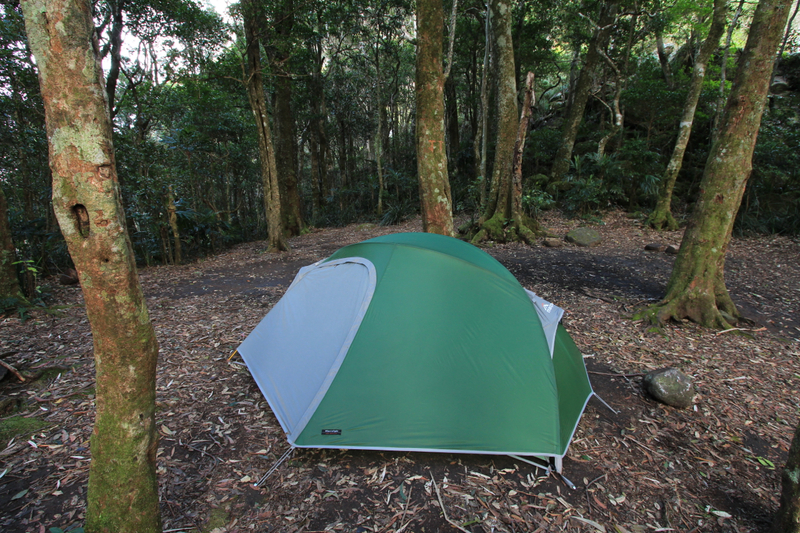 By planning to camp at Rum Jungle it means we have plenty of time to enjoy the summit. As long as it took to climb up, that is how long I can spend admiring this view. Hot on our heels up the South-East Ridge route are two young men. They catch us just as we crest the final approach. This is also their second attempt, having been turned back a year ago due to wind and rain as they neared those challenging final climbs. They are visibly thrilled to have finally made it. As are we. After the young guys leave, we are soon joined by a couple from Brisbane who have walked up via the South Ridge route. Although considered the 'easier' approach this is a misleading description. There is no easy way to climb 1000m over just a couple of kilometres. It is a cracking big day walk when you have to ascend and descend. The couple chat to us briefly and he says he has waited 40 years to get back up here. 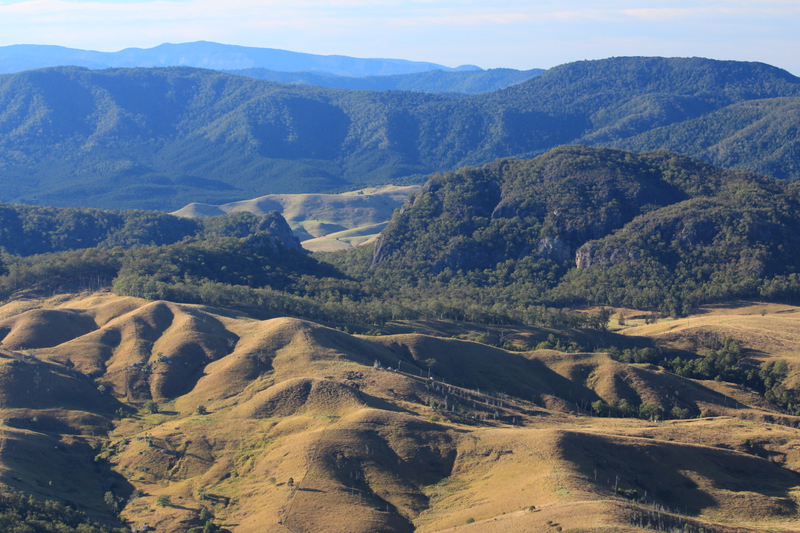 "It is the best view I have seen in Queensland," he says. Caz and I sit on the summit for more than two hours. A friendly thrush visits, we enjoy the warm winter sun. Lunch is eaten, then afternoon tea, before we begin the slow descent to Rum Jungle. I think Didi and GoGo, or rather Samuel Beckett, would be proud of us all, the waiting we have all done, the cumulative time today's summiteers have given, waiting for Barney. Note: There is no camping allowed on the East Peak summit. Past overuse has degraded the area so badly it is still recovering. It is recommended you use the very beautiful and peaceful campsite at Rum Jungle in the saddle between East and West Peak. 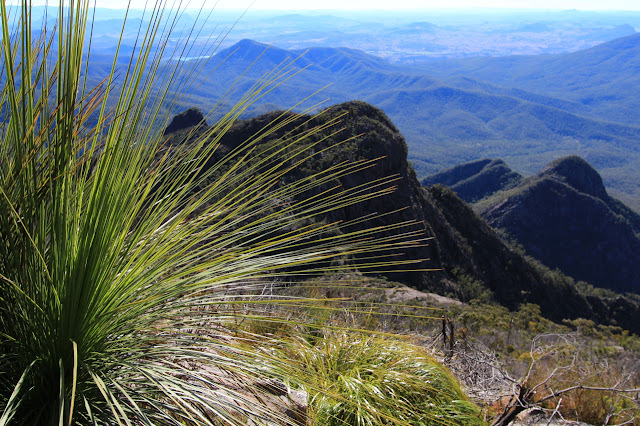 For great local information about walking in South-East Queensland, and in particular Mt Barney and the surrounding peaks, you can't go past a visit to Boonah's Far Outdoors, run by Teresa Cause who is also a guide. Visit www.horizonguides.com.au. Also don't forget the book Take A Walk in South East Queensland by John and Lyn Daly with its detailed track notes. 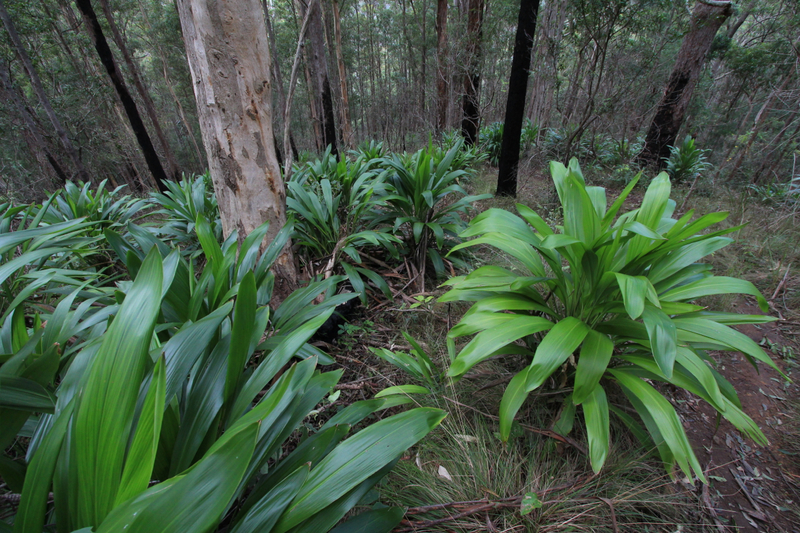 See http://www.takeawalk.com.au. Thanks for the mention Christina. Great post and it's awesome you finally got there. I particularly like Craig's perspective of East Peak with that beautiful light. Must have got a fair way up that side too? As a side note. I've actually moved my blog to wordpress here: https://highandwide.com.au/ Although I haven't been very active lately. Hey Cameron, I've updated the link in the story to point to highandwide.com.au. Craig did get quite a way up West Peak, alway chasing the best light and a different angle! This looks very challenging but the views are fantastic and sense of achievement must be great! I've been thinking of Mt Barney for some time but really want to take a hiking partner due to its isolation and of course as you know, the weather doesn't always co-operate! I think I will focus on finishing the smaller Mt Maroon. I started that walk too late in the day and we decided to head back before dark. I'm just wondering what kind of shoes you use for these walks as I am finding my current Merrells pretty slippery in damp conditions. Hi Jane, Mt Maroon is a good start. A beautiful walk and nice and steep in parts. The South-East Ridge up Barney was a little more intimidating for me towards the top. As for shoes, I actually walk in Salomons at the moment but have had Keen shoes in the past. Merrell's I think would be just as good as any - in damp conditions everything can get slippery. You could have a look at Fiveten shoes, they use a climbing rubber sole and make some hiking shoes. Although I sometimes think we could all just go back to the old days when every good bushwalker wore Dunlop Volley's! Have fun out there!